Hyderabad has always been a strong showcase for Bidri arts and crafts. 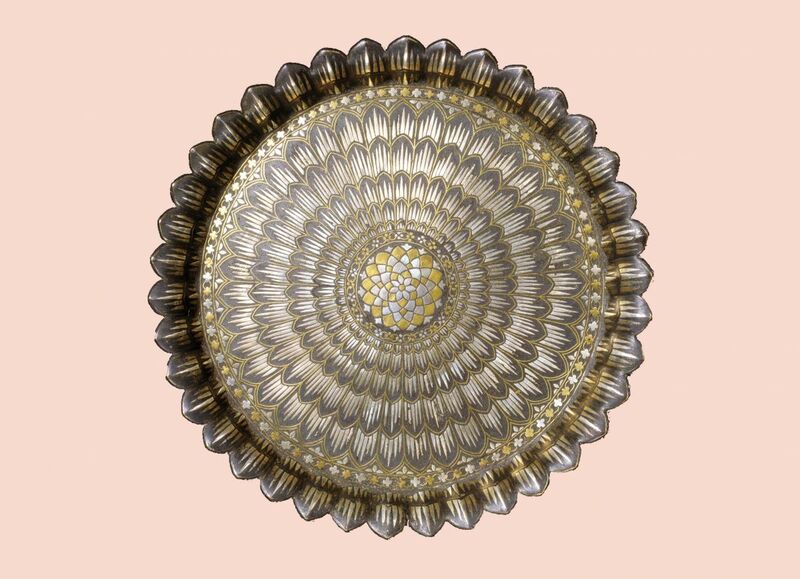 Bidri is an art that involves inlaying gold or silver on metal such as zinc or copper. It is a handicraft that has been given its name from its source of origin. The unique artwork originates from a place called `Bidar’ in Karnataka State. Alauddin Behman Shah, the second ruler of the Behmani Kingdom, introduced Bidri craft seven centuries ago. The style of art has been carried down the centuries by talented Persian artists who settled down in Bidar and trained artisans to produce masterpieces, especially for royal families. Bidriware was practiced in the Persian Kingdom before it was brought in to this country by followers of Khwaja Moinuddin Chishti. This art form developed as a result of fusion of Arabic and Persian cultures. As Bidar is only a couple of hundred kilometres away from Hyderabad, this handicraft has become popular and famous in Telangana and Andhra, as well. Bidri handicraft found a zealous patron in Osman Ali Khan, the Nizam of Hyderabad who made sure that it spread even up to Aurangabad which was part of the erstwhile Deccan Kingdom. What is so unique about Bidriware? Bidriware has been considered a traditional and unique art form that is made with a blend of gold, silver, zinc or copper. Generally, the material blend relied upon is an alloy of 6% of copper and 94% of zinc. Besides this combination, the soil of Bidar also plays a significant part in creating the magic weaved by Bidri artisans. Sophisticated motifs and designs are inlayed to make a glittering white contrast over darker backgrounds. The traditional products of this art form are exemplary as they symbolise elite and royal life and they adorn aesthetically living spaces. Products that display Bidri artwork include shehnai musical wind instruments such as oboes and clarinets, hookahs or sheeshas, flower vases and wall decorations with Moghal motifs and star motifs, surai-types of vases in different motifs and shapes, spittoons or ugaldaans, jewellery boxes and round containers with lids that were dome-shaped. This kind of artwork is also found in statues of animals such as horses, elephants, and camels and birds such as swans and peacocks. The unique Bidri art of gold or silver engraved on metal has fascinated people of Hyderabad and it still flourishes today while enthralling many a buyer with its lure. Bidriware involves an eight-stage process. It includes moulding, smoothening with the help of filing and then the stage of designing by means of chisels. This is followed up by the process of engraving with hammers and chisels, and it has to do with inlaying of pure silver. This stage is subject once again to smoothening. Buffing and oxidizing come after this with the use of soil and ammonium chloride. So, Bidriware is a process of manufacturing from alloys of zinc and copper metals as they are cast in the ratio of 1:16. At the outset, the presence of zinc gives the alloy a blackish deep colour. A mould is created at first by using soil indigenous to Bidar. The mould is made by adding resin and castor oil. Molten metal gets poured later to create a cast. This is smoothened later with the help of filing. This cast gets further coated with a strong copper sulphate solution. The designs are then etched free hand over this cast with the help of a metal stylus. It is finally secured in a vise and artisans make use of smaller chisels to have the designs engraved over this free hand etching. Flattened strips of pure silver and fine wire are hammered into those grooves. The item then goes for filing and buffing and it is finally smoothened to remove that temporary black coating. 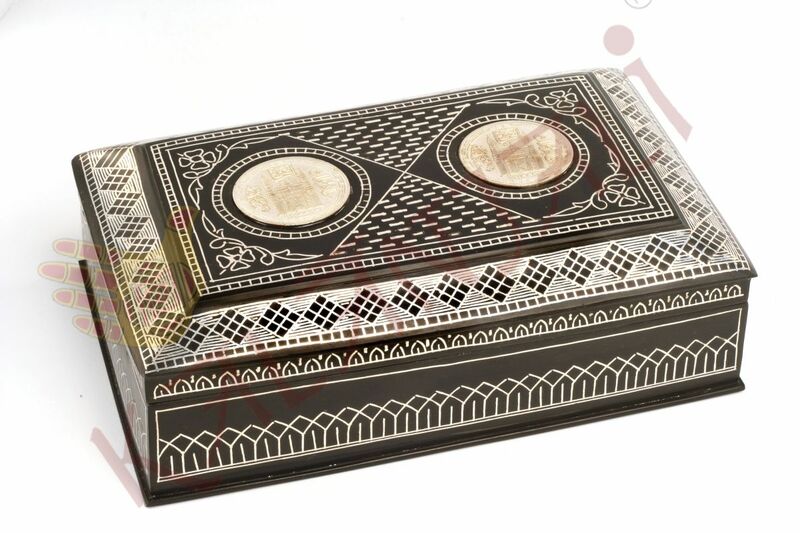 This process results in a silver inlay which is conspicuous in comparison with the gleaming metallic surface which by now becomes silvery white. The Bidriware piece is now ready for the final process of blackening. Artisans use Bidar’s unique soil to achieve this. It is mixed with water and ammonium chloride to produce a paste. The mixture gets rubbed on to a heated Bidri surface which darkens the body of the cast without affecting its silver inlay. The paste gets clearly rinsed as it reveals a silver and shiny design which looks stunning and quite resplendent against the remainder of the black surface. Oil is applied during the finishing touches for the piece to strengthen the matt coating to give a shiny black look along with a luminous silver inlay. The craftsmen create designs in the forms of leaves, flowers, human figurines, geometric shapes and stylized poppy plants. In the olden days, Bidri work was used in making hookahs, sheeshas, and betel leaf holders, earrings, trays, ornament boxes, and other jewellery items and showpieces.